As exciting as the book? No, one better. 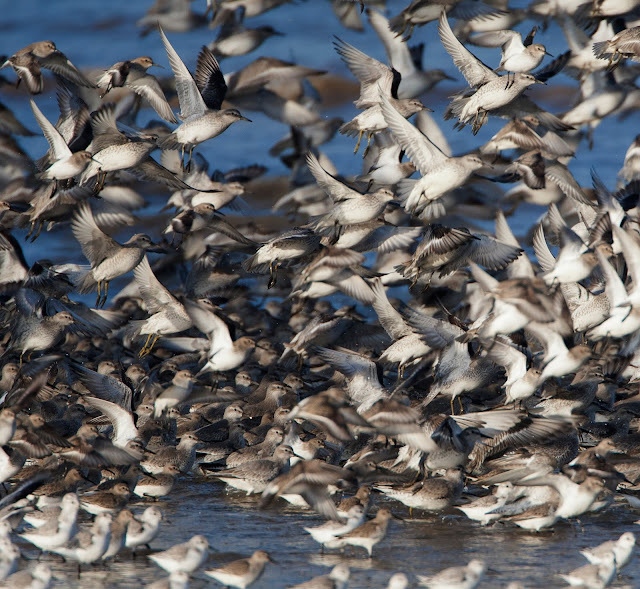 For me there is nothing more exciting than a beach full to bursting with migratory shorebirds. I'd been looking forward to today for some time. The last part of this week was spent nervously eyeing the weather forecast and crossing fingers for sunshine. I even arranged a day off work. Well, tide was looking good for a lot of birds close to shore and within range of long lenses and telescopes. I was planning to spend the morning photographing the birds on Hoylake shore and looking to see if any were colour ringed. There were many others who had braved the tumbling temperatures to take in the avian spectacular. 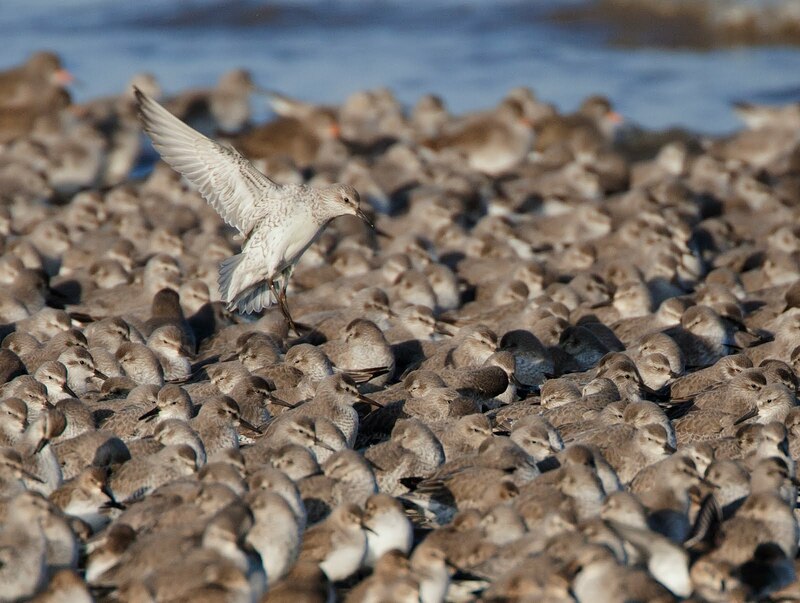 The tide was pushing the birds really close, close enough to shore and humans to make them a little nervous. Although people, dogs and photographers all behaved well the birds took flight on regular occasions. The sound of the wings as awesome as ever. The constant movement of the flock made finding colour ringed birds tricky, but between the assembled birdwatchers 5 Sanderling and a Knot were recorded. The Knot was particularly cool I had seen it at Thurstaston in 2010 and in Norway last year! 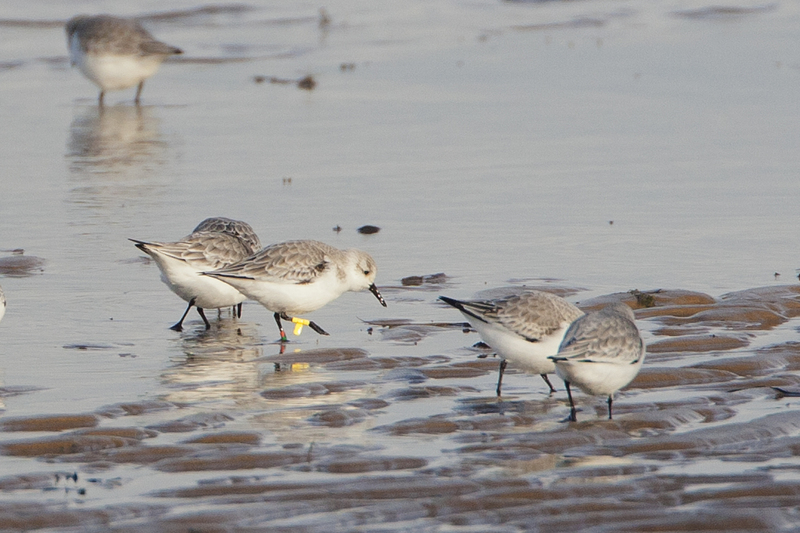 I have never seen a colour ringed Sanderling on these shores but was able to get full codes for 3 and photograph 2. Above all it was a chance to be close to these brilliant birds, watch and photograph them as they went about their wintering business. 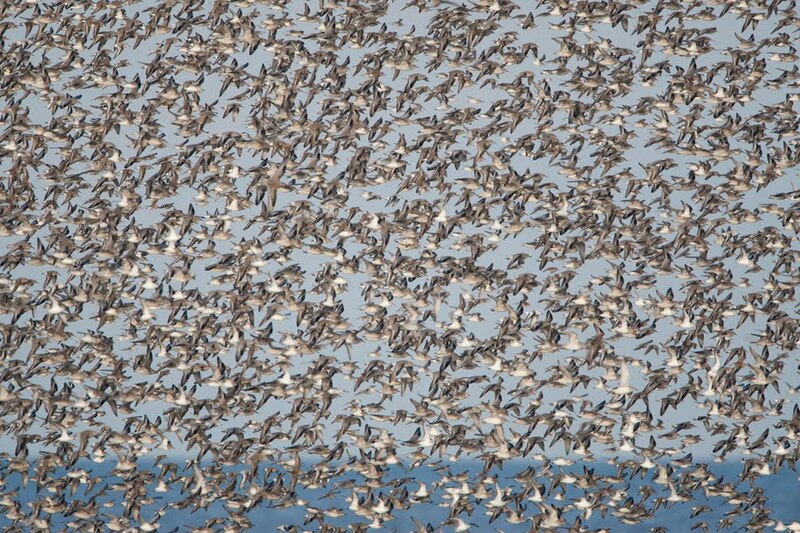 Numbers were staggering, 17,000 Knot and over 1,000 Sanderling parading in front of us. Through the camera they looked like a thick sown crop swaying in a breeze, all 51 shades of grey shimmering in the sun. The action starts to subside with the receding tide, I'm left with nearly 600 pictures and some more colour ring combinations in the notebook.